Lymph plays an important role in the immune system. The lymphatic system helps to clear the body of toxic waste products, which makes this a system of utmost importance for our health and well-being. The lymphatic system works with the circulatory system. The circulatory system, the heart and blood, plays a key role in bringing many needed substances to the cells and then removing the end products of cell metabolism. Lymph is a fluid that originates in the connective tissue spaces of the body. Body cells live in a liquid derived from the bloodstream, called tissue fluid or extracellular fluid. Water and dissolved substances, such as nutrients and oxygen are constantly filtering through the capillary walls into the spaces between the cells and constantly adding to the volume of this tissue fluid. Under normal circumstances, a portion of the extracellular fluid, along with some of the end products of cellular metabolism, including carbon dioxide and other substances, goes back into the bloodstream through the blood capillary walls of the venous circulation. In the connective tissue, in addition to the blood-carrying capillaries, there are microscopic vessels, called lymph capillaries, which drain excess fluid, protein, toxic waste material that do not return to the blood capillaries, so they don’t accumulate in the tissues. As soon as tissue fluid enters the lymph capillaries, it is called lymph. 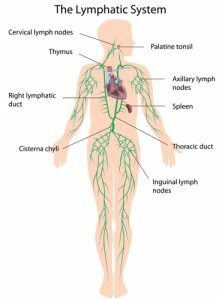 Lymph flowing through the lymphatic capillaries next moves into successively larger and larger lymph vessels, called collectors and ducts, which eventually empty their lymph into the veins near the heart. Before the lymph reaches these veins, it flows through a series of filters or purification centers, called lymph nodes. The nodes break down and destroy bacteria and other foreign, potentially harmful particles so they can eventually be flushed out of the body. In summary: all cells release metabolic waste products into, and take up nutrients from the surrounding extracellular fluid. The cells are able to take up nutrients better if the waste material is removed from the extracellular environment. The lymphatic system acts as a waste removal system of the body. It fine tunes the drainage of the extracellular or connective tissue, meaning, it evacuates the excess water and other substances (large proteins, foreign bodies, pathogenic substances- germs, toxins, etc.) from it. This potentially harmful material is filtered by the lymph nodes that are located throughout the body. The superficial lymphatic circulation, just under the top layer of the skin.About 70% of the body’s lymph is drained here by the superficial lymph collectors. It is not directly stimulated by exercise. Lymph Drainage Therapy moves it. The deep lymphatic circulation of the muscles, below the fascia, and the deep circulation of the organs. About 30% of the body’s lymph is drained here. It is activated by muscle contractions, thus exercise helps to move it. Poor circulation of blood in the body causes an overload of foreign, harmful waste matter in the extracellular tissue, and consequently, in the lymph vessels and lymph nodes. When lymph drainage slows down or becomes obstructed, harmful waste matter begins to accumulate in the extracellular fluid. This results in an increased thickness of this vital fluid, thus preventing proper nutrient distribution to the cells, weakening and damaging them. Lymph Drainage Therapy (LDT) is an original hands-on method of lymphatic developed by Bruno Chikly, MD, of France. Created out of his award-winning research on the lymphatic system, LDT takes traditional lymph drainage techniques and adds a level of precision consistent with recent scientific discoveries. Using exact anatomical science and gentle manual techniques, I am able to detect the specific rhythm, direction and quality of the lymph flow in the body. From there I use my hands to perform Manual Lymphatic Mapping (MLM) of the vessels to assess overall circulation and determine the best alternate pathways for draining body-fluid stagnation. Reduces muscle spasms and pain. Of course, it is important for the therapist to obtain the consent of the physician for lymph drainage if a client is receiving treatment for cancer. For many people who are living with cancer or chronic illness, stress, pain, fatigue and weakness can interfere with their ability to accomplish daily functions and adversely affect their quality of life. When stress and pain are effectively managed, people have more energy and stay more active which contributes to greater confidence and the ability to maintain independent living.